A history of the people's militias who fought Italy's fascists covering the birth, growth and decline of the world's first anti-fascist group, the Arditi del Popolo. By the end of World War I, the working class in Italy were in a state of revolutionary ferment. Not yet ready for the conquest of power themselves, workers and peasants by 1918 had won a variety of concessions from the state: an improvement of wages, the eight-hour day, and a recognition of collective contracts. In the countryside, the peasantry opened up a second front against the state by occupying the land that had been promised them before the war. The Visochi decree of September 1919 merely validated the co-operatives that had already been set up while the ‘red leagues’ assisted the formation of strong unions of day labourers. However, 1919 also marked the initial signs of capital defending itself against the growing onslaught. A meeting of industrialists and landowners at Genoa in April sealed the first stages of the ‘holy alliance’ against the rise of labour power. From this meeting were drawn up plans for the formation, in the following year, of both the General Federation of Industry and the General Federation of Agriculture, which together worked out a precise strategy for the dismantling of the labour unions and the nascent councils. Alone, however, the industrialists and landowners could not undertake the struggle against the labour movement. The workers themselves had to be cowed into submission, had to have their spirit of revolt broken on the very streets they walked and the fields they sowed. For this, capital turned to the armed thuggery of fascism, and its biggest thug of all: Benito Mussolini. Immediately following the end of the war, there was a veritable flowering of anti-labour leagues: Mussolini’s ‘Combat Fasci’, the Anti-Bolshevik League, ‘Fasci’ for Social Education, Umus, Italy Redeemed, etc. At the same time, members of the war volunteer corps, on being demobilised, organised themselves into an elite force of 20,000 shock troops and were immediately put to use by the anti-labour movement. This movement mostly comprised the middle or lower middle class. Ex-officers and NCOs, white collar workers, students and the self-employed all allied themselves to the fascist cause in the towns, while in the countryside the sons of tenant farmers, small landowners and estate managers were willing recruits in the war against the perceived Red Menace. The police and the army both actively encouraged the fascists, urging ex-officers to join and train the squads, lending them vehicles and weapons, even allowing criminals to enrol in them with the promise of benefits and immunity. Arms permits, refused to workers and peasants, were freely handed over to the fascist squadrons, while munitions from the state arsenals gave the Blackshirts an immense military advantage over their enemies. Ultimately, by November 1921, the various hit squads were welded together into a military organisation known as the ‘Principi’, with a hierarchy of sections, cohorts, legions and a special uniform. To compensate for the shortcomings of the Socialist Party (PSI – Partito Socialista Italiana) and the main trade union, the CGL, militants of various tendencies, anarcho-syndicalists, left socialists, communists and republicans formed, in June 1921, a people’s militia, the ‘Arditi del Popolo’ (AdP), to take the fight to the fascists. While politically diverse, the AdP was a predominantly working class organisation. Workers were enlisted from factories, farms, railways, shipyards, building sites, ports and public transport. Some sections of the middle class also got involved, including students, office workers and other professional types. Structurally, the AdP was run along military lines with battalions, companies and squads. Squads were made up of 10 members and a group leader. Four squads made up a company with a company commander and three companies made up a battalion with its own battalion commander. Cycle squads were used to maintain links between the general command and the workforce at large. In spite of its structure, the AdP remained elastic enough to form a rapid reaction force in response to fascist threats. AdP behaviour was dictated by whatever political group held sway in a particular locale, although most sections were allowed virtual autonomy over their actions. These sections were quickly set up in all parts of the country, either as new creations, or as part of already existing groups like the Communist Party of Italy (PCdI – Partito Comunista d’Italia), the paramilitary ‘Arditi Rossi’ in Trieste, the Children of No-One (Figli di Nessuno) in Genova and Vercelli, or the Proletarian League (Lega Proletaria – linked to the PSI). Overall, at least 144 sections had been set up by the end of summer 1921, with a total of about 20,000 members. The largest sections were the Lazio sections with about 3,300 members, followed by Tuscany, 18 sections, with a total of 3,000 members. The Italian anarchist, Errico Malatesta, commenting on the massive factory occupations in northern Italy in September 1920 which involved 600,000 workers, predicted “If we do not carry on to the end, we will pay with tears of blood for the fears we now instil in the bourgeoisie”. His words were to be prophetic, as both the PSI and CGL, instead of expanding the struggle from the factories into the communities, collaborated with the state to return the workers to their jobs. It was from this moment onwards that the state moved on the offensive and Mussolini’s ‘revolutionary action’ squads were supplied with enough arms to take to the streets. However, by March 1921, there were growing signs of working class defence structures being put in place. 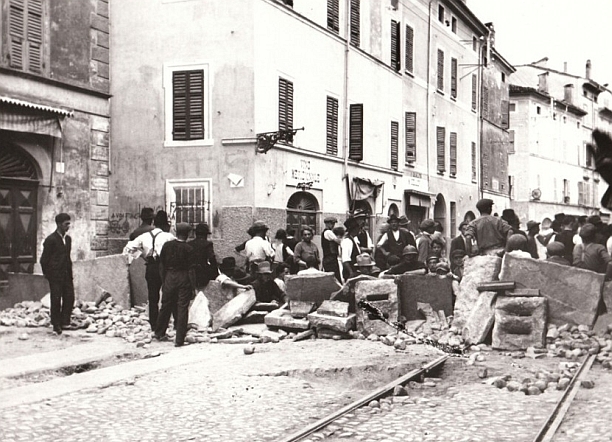 In Livorno, when a working class district (Borgo dei Cappucini) came under attack by the fascists, the whole neighbourhood mobilised against them, routing them from the town. In April, when the fascists launched an assault on one of the union centres (Camero del Lavoro), the workers held strike action on the 14th and surrounded the fascist squad, only for the army to rush to the fascists’ defence. By July, the working class had created their own armed militia – the Arditi del Popolo. The AdP first saw action in Piombino on 19 July 1921, when they attacked a fascist meeting place and rounded up the fascists inside. When the Royal Guard tried to intervene, they too were forced to surrender. The AdP held the streets for a few days before the sheer size of police numbers forced them to withdraw. However, just as the AdP was building up the momentum on the streets, they were betrayed by the PSI who were more interested in signing a pact of non-aggression with the fascists; this at a time when the fascists were at their most vulnerable. Socialist militants were forced by their leadership to withdraw from the AdP, while the CGL union ordered its members to leave the organisation. The communists went one step further by forming their own pure ‘class conscious’ squadrons thus decimating the movement further. According to Gramsci, “the tactic…corresponded to the need to prevent the party membership being controlled by a leadership that was not the party leadership”. Quite soon, only 50 sections of 6,000 members remained, supported both by the anarcho-syndicalist Unione Sindicale Italiana (USI) and the anarchist Unione Anarchica Italiana (UAI). A number of these sections went into action again in September in Piombino when the fascists, who had burned down the offices of the PSI (the same organisation that had sold them out a month before), were intercepted by an anarchist patrol and forced to flee. Piombino was soon to become the nerve centre of the defence against fascism, defending itself a further fascist onslaught in April 1922, before finally succumbing after one and a half days of fierce fighting, when the fascists, aided by the Royal Guard, were able to capture the offices of the USI. In July 1922, the reformist general strike to defend ‘civil liberties and the constitution’ marked the final disaster for the labour movement, as the work stoppages were not, and could not be, accompanied by aggressive direct action. The fascists simply ran public services with scabs and made themselves masters of the streets. With the strike’s collapse, the fascists mustered their forces to deal with the last remaining outposts of resistance, one of which, Livorno, succumbed to a force of 2,000 squadristi.